bl.uk > Online Gallery Home	> Online exhibitions	> Asia, Pacific and Africa Collections	> Valley of the Jugdulluck. 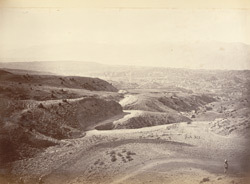 Photograph of the valley at Jagdalak in Afghanistan, taken by John Burke in 1879-80. The narrow Jagdalak Pass, situated between Kabul and Jalalabad in Afghanistan, cuts through the forbidding Hindu Kush mountain range and was the scene of bitter conflict during the First (1839-42) and Second (1878-80) Afghan Wars. It resonates in British military history particularly because many British soldiers were killed here during the First Afghan War.